If, like me, you have a Thomas the Tank Engine obsessive living under your roof, then the National Railway Museum is the perfect trip for you. Located in York city centre, close to the railway station, the Museum’s Great Hall is filled with locomotive engines of all ages, shapes and sizes including favourites like the Mallard and Flying Scotsman (currently being restored). You can climb inside some of the trains’ cabs, walk underneath a locomotive to see its workings and watch the Great Hall’s turntable in action. The nearby Station Hall is home to a number of luxuriously kitted out royal carriages, used to transport Monarchs such as Queen Victoria in the utmost comfort. 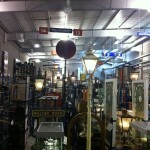 Besides the locomotives and rolling stock, you can visit the Museum’s warehouse and see the thousands of catalogued railway-related objects that are not on display in the Museum. From station furniture to vintage luggage, silver teapots to model trains, the floor-to-ceiling collection is enormous, eclectic and strangely fascinating. 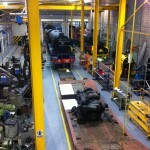 The Museum’s functioning workshops, where locomotives are restored and maintained, can also be viewed from an elevated gallery. When you’ve finished indoors, head outside to the railway-themed picnic and play area, or take a ride on the miniature railway. Finally, if you have time, hitch a ride to the heart of the city centre on the Museum’s Road Train to see York’s historic Minster. Even if you’re not a train geek, the National Railway Museum is a fun and fascinating place to take the family, with enough activities to keep you busy all day. 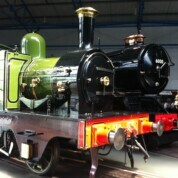 Admission to the National Railway Museum is free. 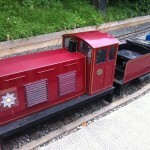 Tickets for the Miniature Railway cost 50p, under 2s ride for free. Tickets for the Road Train to York City Centre (York Minster) cost £2 each way for adults, £1 each way for children. 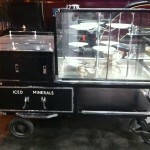 There is a café located in the Great Hall (surrounded by the locomotive engines) which serves hot and cold drinks, sandwiches, snacks and kids meal deals. As a rough guide a cappuccino costs approximately £2.20 and a kids meal deal is approximately £4. High chairs are available. There is also a restaurant in the Station Hall serving hot main meals (from £5.95), cold meals (from £3.75), kids’ meals (from £3.95) as well as a range of hot, cold and alcoholic beverages. High chairs are available. There is an outdoor picnic area in the South Yard, next to the play area. 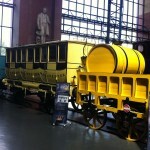 The National Railway Museum, York, has fantastic facilities for families. 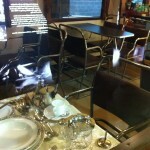 The Museum is accessible to pushchairs and there are both baby changing and baby feeding facilities. There is a children’s play area and a family picnic area. The Museum hosts regular workshops and events for children and families – check the website for details. Paddington Bear will be visiting the Museum for the half term holidays from 27 October to 4 November 2012. 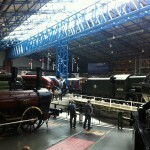 The National Railway Museum is open daily from 10am to 6pm. The Station Hall is closed for renovation from 3 September to 19 October 2012. The National Railway Museum is located in the centre of York, close to York railway station.